Cancer Research Building extension to be more than just physical connector. The $62.5 million project will stretch above Laney-Walker Blvd. A large steel girder now welded against the side of the M. Bert Storey Cancer Research Building stretches across Laney-Walker Boulevard toward the Georgia Cancer Center outpatient building, where it will one day help connect them, providing both functional and symbolic links. The three-story connector between the buildings, and a five-story extension of the Research Building parallel to Laney-Walker, are starting to round into form at Augusta University as crews work to finish the $62.5 million project expected to be completed in just over a year. Workers last week welded one of the beams that will support the connector a couple of stories above the street, and link the research and clinical sides. “Always the problem in medicine is the basic science people never talk to the clinicians, so here’s about as close as you can get,” said Dr. David Hess, the interim dean for the Medical College of Georgia. The connectors will have offices and provide access for collaboration, but more important is the 72,000-square-foot addition to the research building, which will include 6,000 square feet of renovated space in the current building. There has been an administrative renovation as the cancer center, which once reported to AU’s president, has been brought back under the MCG dean. Checking with other cancer centers at other institutions found that most handled it this way, Hess said. That makes more sense for those working in basic research, too, such as the department of biochemistry and molecular biology, Hess said. “A lot of that department does cancer research,” he said, and they have labs within the cancer research building. There is still a need to recruit a new cancer center director, but that search has not yet begun. AU President Brooks Keel wants to wait until there is a permanent dean named for MCG, Hess said. That formal search has not yet begun, but could start as early as the next fiscal year, which begins July 1, said AU spokeswoman Christen Engel. 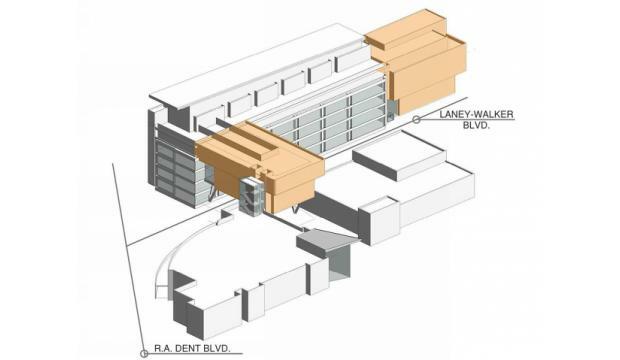 When it is finished, the three-story connector over the road will serve as a gateway sign for those entering the Health Sciences campus from that side, something that has been needed, Hess said. “That’s important because one of the problems we have is you don’t even know when you are on our campus,” he said. Along with the gleaming new Dental College of Georgia building and the J. Harold Harrison Education Commons building just down R.A. Dent Boulevard from the cancer project, “It’s a pretty nice new campus on this end,” Hess said.